pH is an incredibly important parameter that is measured in nearly every water quality application. It plays a role in the taste (acid = fresh, neutral = bland, and alkaline = inedible) and the preservation of food. In environmental sampling and monitoring, high or low pH values can be indicative of pollution. In wastewater treatment, pH is regulated as part of discharge permitting and many treatment processes are pH dependent. In biotechnology, pH must be closely monitored during the production of immunoassay solutions. These are just a few of the many applications in which the pH measurement is a valuable tool. You want good pH data. Who doesn’t? You deserve good data, but for good pH data you need to calibrate. You need to calibrate well and calibrate often. Electrode calibration is necessary in order to establish the slope and zero point of the electrode. Since both of these can change over time, frequent calibration is necessary. The frequency of calibration depends on the application, with some applications requiring daily calibration while others may require only weekly or monthly calibration. More frequent calibration is recommended when measuring in heavily contaminated, low-ion, strongly acidic, and high temperature solutions. OK, so we know we must calibrate, but for some reason your pH probe is not calibrating. 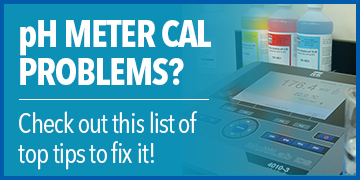 There are several things you should check if you’re experiencing pH calibration problems. Probes for your pH meter generally last 12-18 months. This holds true whether the probe is being used or not. The lot code will determine the age of your pH probe. A lot code is two numbers then a letter. The numbers indicate the year of manufacture and the letter indicates the month, i.e.-A=January, B=February, C=March etc. Please note that the letter “I”is not used, this means H=August and J=September and so on. Keeping your pH probe clean can also help eliminate pH calibration problems. pH electrodes usually require weekly or monthly cleaning. Always check the meter and electrode manuals for calibration and routine maintenance information. Before cleaning a pH electrode, it should be noted that distilled or deionized (DI) water should not be used for electrode storage or soaking. This can result in permanent damage to the electrode. However, it is recommended that DI water be used to rinse the electrode when cleaning and/or transferring to another solution. Also, it is preferable that pH electrodes be chemically, rather than mechanically, cleaned. If the reference junction on the probe is not clean the probe may become unresponsive. Regularly soak the electrode in a 1:1 bleach water solution for 15-30 minutes to reduce the chances of a clogged reference junction. If hard deposits have built up on your probe (ie. barnacles), you can clean these by soaking the pH probe in vinegar or 1M (molar) HCL (hydrochloric acid) for about 3 minutes. Vinegar soaking may require a longer period of soaking to remove hard deposits. Place the electrode for 5 minutes in 0.1M HCL or 0.1M NaOH (sodium hydroxide). If the buildup is not removed, the solution should be cautiously heated up to about 50°C (122°F) before the acid or alkaline concentration is increased. If your probe is damaged, broken glass bulb, crack in the glass etc., the probe must be replaced. The term ‘glass electrode’ is not indicative of the material used to construct the electrode body, as electrodes can have either a plastic or glass electrode body. Rather, ‘glass electrode’ is used to describe the membrane material (i.e. glass membrane). Plastic body electrodes are more rugged and less likely to crack than glass, while glass electrodes typically possess a greater range of operating temperature. Glass electrodes are also commonly refillable. Regardless, if there is obvious visual physical damage, replacing the pH sensor is the best option. Read Anatomy of pH Electrodes to find out more. Always store your pH probe in a moist environment or submerged in buffer 4 solution. If you find your pH probe has dried out, it may need to be replaced. Storing in pH 4 buffer helps prevent growth or buildup in the storage environment that could coat the sensor and affect your readings. All pH electrodes can be permanently damaged if they are improperly stored. Recommendations regarding the storage of a pH electrode vary based on the length of time the electrode will be stored, as well as the electrode type. Regardless of the length of storage or the electrode type, no pH electrode should be allowed to dry out. Also, pH electrodes should never be stored in DI water. Use pH 4 buffer as it also helps eliminate leaching of electrolyte. In the event your pH electrode has been allowed to dry out, soaking the electrode in a suitable solution might successfully rehydrate it. YSI field electrodes should be placed in pH 4 buffer and lab electrodes should be placed in a solution of 3 M KCl (Ag+ free). Both lab and field electrodes should be soaked for at least 24 hours and recalibrated afterwards. If electrode performance is poor after rehydration and subsequent cleaning procedures are unsuccessful, the electrode will likely need to be replaced. Check your probe’s temperature specifications. pH will not function accurately if the temperature probe is out of specification because the electrode slope is dependent upon the temperature of the solution. The accuracy of the pH data is dependent on the accuracy of the temperature data. The thermistor is not able to be calibrated so if your temperature sensor is no longer good, you will need to replace the electrode. You never want to re-use buffers for calibration. Once buffers are used for calibration, they are assumed contaminated and should not be used again. Reusing buffers can lead to slow responding pH probe performance or the inability to calibrate at all. This reuse can also make it difficult to determine whether the probe or the buffers are causing the pH calibration failure. A good way to use reused buffers is for probe rinsing only. Expired buffer solutions should not be used (are you seeing a theme here) and buffer bottles should not be left open. Carbon dioxide in the air can change the pH of basic buffer solutions, so basic buffer bottles should only briefly be opened. Use opened containers of buffer as soon as possible. If you're unsure of the shelf life of your calibration solutions and buffers check here. It is best to perform at least a 2-point calibration and pH 7 buffer MUST be one of those points. The pH buffers used should differ by at least two pH units and should bracket the expected in-situ pH conditions. Unless the sample is expected to be above pH 7, basic buffers should not be used, as their pH value quickly changes by absorbing CO2. 3-point calibrations are typically completed when the sample pH conditions are not well understood. Asymmetry and slope are determined for both 2- and 3-point calibrations. A 1-point calibration will only determine the zero point, not the electrode slope. The range of use of 1-point calibrations is limited and should only be completed with pH 7 buffer. The pH value obtained can be used to compare to previous results, but is not an absolute value. The electrode and calibration container should be rinsed between calibration points with the solution that follows, as any displaced buffer that is carried over can lead to measurement error. For example, rinse with pH 10 buffer if you have finished calibrating to pH 7 and are preparing to calibrate to pH 10. Alternatively, the electrode can be rinsed with DI water and carefully dabbed dry. The calibration container should always be clean. The size of the calibration container typically doesn’t matter, as long as the electrode junction is immersed. 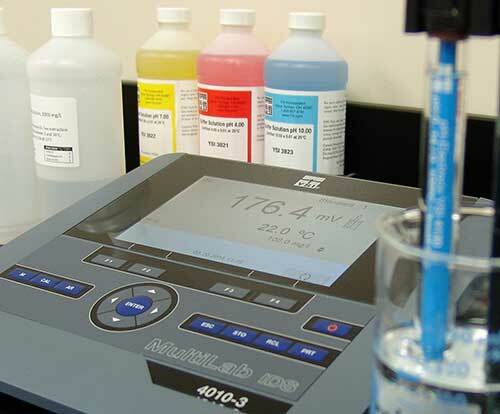 Although it is not always required (and several instruments have auto buffer recognition), it is best to begin calibration with pH 7 buffer and could easily be part of your Standard Operating Procedure (SOP). Since both of these can change over time, frequent calibration is necessary. The zero point, also known as the asymmetry potential/point, is typically the mV value when the electrode is placed in pH 7 buffer. The theoretical zero point is, not surprisingly, 0 mV. This is true because the reference electrode is typically in a solution of electrolyte that has a pH of 7. If the reference and the sensing electrode are both in a solution with the same pH, there should theoretically be no difference in their potentials, resulting in a display of 0 mV on the pH meter. A new electrode will have an asymmetry potential that is typically only a few mV if it has been carefully prepared. Response time should be no longer than 60 seconds and good electrodes should be stable within that time. This response time can depend on the age and cleanliness of your probe and a slow response suggests the electrode is old or dirty. Issues during calibration may be the result of an aged electrode. Electrodes will generally last 12-18 months, even if they are not being used. Electrodes will age faster if used in extreme operating conditions (strong acids, high temperatures), resulting in a slower electrode response, change in slope, and change in asymmetry (i.e. zero point). Rather than displaying pH values, it is best to display mV values on the instrument when checking the sensor performance or calibrating. Not all instruments have this capability, but some instruments do. 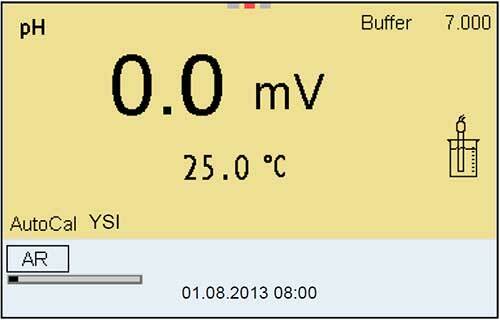 Buffer 7 should be 0 to +/-50 mV. Buffer 4 should be 165 to 180 mV away from the buffer 7 mV value, in the positive direction. Buffer 10 should be 165 to 180 mV away from the buffer 7 mV value in the negative direction. If you accept an out-of-range calibration, your probe will not calibrate properly. It is highly likely you will not collect any usable pH data if an out-of range calibration is accepted. For refillable electrodes, ensure the fill level of the electrolyte is at least 2 cm above the level of the measurement solution. Replace the electrolyte if it has become contaminated. For YSI laboratory electrodes featuring a refillable reference, the first step to calibrating and/or taking a measurement is to open the refill opening. Depending on the model, the refill opening is either a slider (left image) or a stopper (right image). The refilling opening must always be open during calibration and measurement. The reference junction must be completely submerged in solution. The temperature sensor must also be in solution in order to accurately compensate pH for temperature. The pH values of buffer solutions are temperature dependent (as mentioned earlier) and the response can vary from manufacturer to manufacturer. Also, the pH values of buffers in a buffer set can vary from one set to another. Modern pH meters automatically adjust for the respective temperature profile once the buffer set used has been correctly set. View our webinar "Making Better pH Measurements in Sampling and Long-Term Monitoring Applications"
Why is the pH Scale Logarithmic? Is pH the Measurement of Hydrogen Ion Concentration or Ion Activity? These tips are very useful. I just had a problem with my pH meter, and your tips helped me solve it. I am really grateful. Are there any solutions that tend to throw a meter out of calibration? High pH or low pH. I had a ex-tech tell me a low pH buffer 4 will throw a meter out of calibration while 7 buffer won't. Sounds odd to me. This blog series is incredibly useful - not just for me - but for my students - especially the information on pH electrodes - which we all tend to take for granted!